I have been salivating over meal prep pictures on Pinterest forever so I finally took the plunge and ordered some of these containers from Amazon. That was the easy part! I decided to do our first week with grilled chicken salads. I made four for me and three for Gustavo to take to work. Doing this made me feel like such an organization winner and that's a pretty good feeling when you feel like an organization failure sometimes. 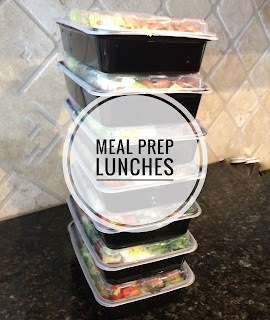 Preparing these lunches ahead of time helps me just grab something and eat quickly so I can feed the kids and do other things. It also helps me eat healthy instead of grabbing a muffin or granola bar because it's the first thing I see. Gustavo grilled the chicken and the rest is romaine lettuce, cherry tomatoes from the farmer's market, boiled egg, cucumbers, cilantro, croutons in a cupcake liner, red pepper and a snack pack of almonds from Trader Joes. I added some dressing and gobbled it down today. Delicious! I'm looking forward to my to go lunch the rest of the week too. Check out the meal prep eye candy from Pinterest. Most of the recipes I like are from Damn Delicious and I make her recipes all the time. They are always good and always easy. I love her and she has a cute corgi too! Just a note, that without the croutons these would be Paleo or Whole 30 approved. Do you do meal prep? What are your favorite ways to get your food organized for the week?